Cracked: The City’s Micro-Yards . . .
Heat waves do not break, or crack. Most linger in an ebb and flow cycle of several oscillations. The chain of days bends rather than breaks and may linger for several warm weather months before an abrupt push of colder autumn air arrives and a new fall pattern takes root. One city immigrant thrives in the late summer heat and light. This plant slips into a narrow growing place. The most minuscule of front yards, the intersection of sidewalk and foundation. The city’s micro-yard is a distinct slit of soil, enough to conjure up a plant. The setting conveys little moisture or nutrients. Exposure, whether rain, wind, dog, or human traffic, is often constant. 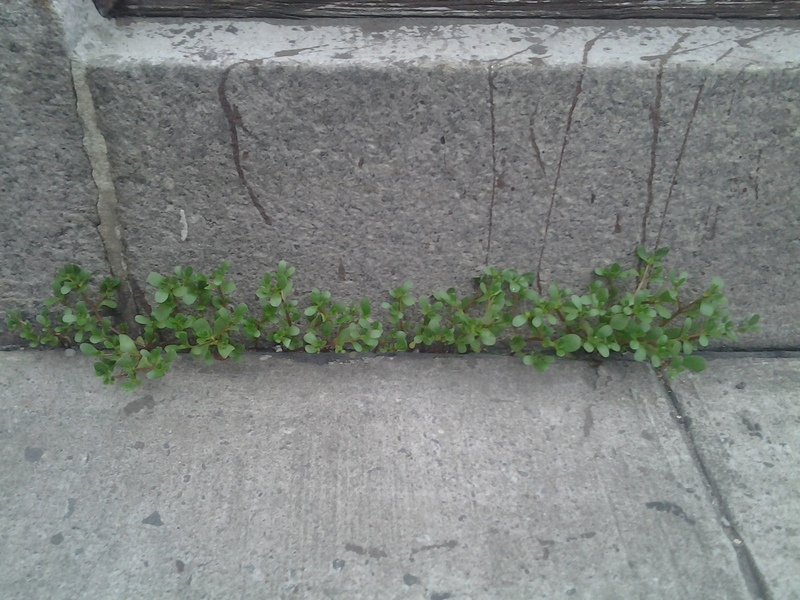 Purslane is one New York resident that resists and emerges with an appearance of pride. Sprouts in snippets may form a single community chain if left to alone to grow. Many such gatherings follow the intersection of where we live meets where we walk. 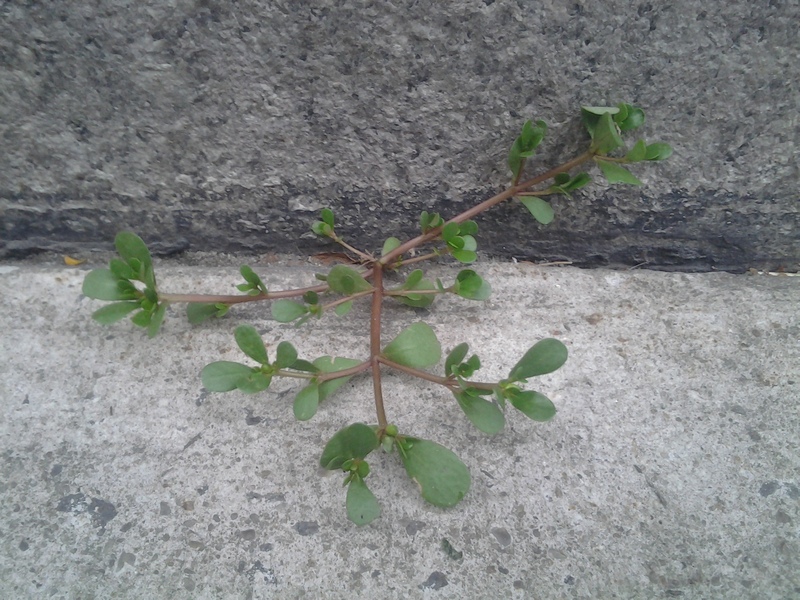 Manhattan’s entire west side hosts Portulaca oleracea, the purslane much mentioned as cuisine. Central Asia was the more arid land from which this immigrant annual arrived. The semiarid conditions of its origin explain how thin spots of loose soil found among rocks finds a parallel in the big city crack in the masonry. “(I’m Looking For) Cracks in the Pavement” . . . a song by Duran Duran, a spot where just enough water supports this plant replete with interior moisture. The red stems and teardrop uniform green leaves, fleshy and juiced. A passing glance gives one reminiscences of Grandma’s household jade plant in miniature. Urban Forager, author Ava Chin, knows from her own experience what has sprouted from Staten Island, Brooklyn, and Manhattan. I’m sure Queens and The Bronx sustains wild specimens, too. She appreciates the humor in a turn of phrase. One as good as a “From Sidewalk Cracks, a Side Dish” indeed also reinforces the concept of the crack, the often occurring ultimate micro-yard that supports a harvestable, therefore worthy, immigrant wild plant. The analogy can be extended, if one likes such pursuits. 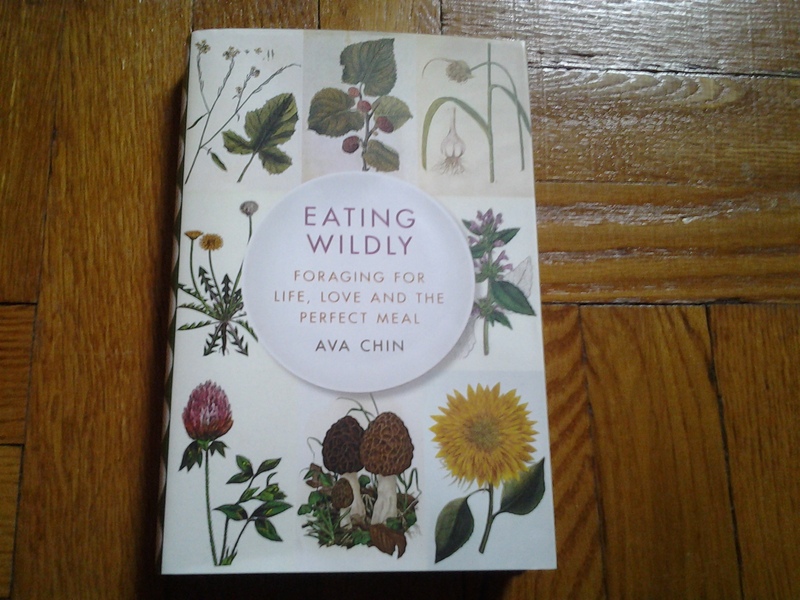 Ava’s book, Eating Wildly: Foraging for Life, Love, and the Perfect Meal, has just been released in paperback. Purslane thrives within its pages as it can be a true vegetable, rightful status for the purslane, which can add viscosity and a tang reminiscent of spinach to a variety of dishes. Allusion to “Reminiscence” three times in one stretch of prose hints the time must be shifting to the one that often conveys life in that way. Autumn is near, but not quite here. People strive. Wildflowers bloom.